Jenn Harris, Genesis Oliver, Ito Aghayere, and Saum Eskandani in Pressing Matters. BOTTOM LINE: An anthology of diverse, surprising stories makes for a compelling theatrical experience. Pressing Matters by Jennifer Jasper is an anthology consisting of six one-act plays. "Etymology" is a love story, depicting the course of a lifelong romance through the words chosen in a spelling bee. "Inheritance" explores gender roles and reproductive rights and how these issues affect one family over several generations. "Free Range" is a solo piece in which a woman testifies in court about how she "neglected" her children in a dystopian, absurdly protective society. "Oscar Clyde Denman" shows how a young girl deals with trauma by developing an imaginary friend, who proves to outlive his usefulness as she grows older. "Thanksgiving in July" is a domestic drama about the relationship of two women who decide to have a child. And finally, "Destination Unknown" (pictured above) is the surreal story of several travelers stuck at an airport, waiting for their flight. The themes that bring these pieces together are, broadly, love and family. Every one of these plays is good or interesting in its own right, even if Jasper never quite brings them together to form any sort of grand thesis. The stories are all fairly distinct, and while they are mostly in the same thematic ballpark, they lack a certain specificity and focus that would make Pressing Matters really cohesive. Two plays in particular, "Free Range" and "Destination Unknown," feel like outliers. The other plays all span years, and are fairly serious in tone, grappling with the ways people change (or don’t) and grow comfortable in relationships and pre-existing family dynamics. These two plays are the most comedic of the lot, and while it’s good to have tonal variety in an anthology, they can’t help but stick out. The surrealism and social commentary of "Destination Unknown" are an odd fit with the rest of the program, and left me mostly scratching my head in its final moments. "Free Range" is the funniest of the plays, driven entirely by an incredible performance by Jenn Harris. It’s both satirical and empathetic, while doing some subtle world-building. It’s a great piece of writing. But one gets the sense that Pressing Matters would be a more coherent piece of theatre if it and "Destination Unknown" were excised. 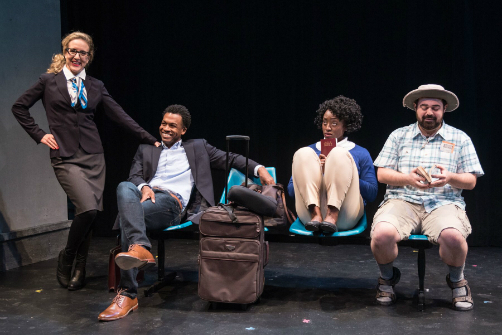 Five actors (Ito Aghayere, Molly Carden, Saum Eskandani, Jenn Harris, and Genesis Oliver) portray all the characters in all six plays. Thematically, it works, suggesting a timelessness and universality to the family issues the show grapples with. This also gives each actor an opportunity to really shine, as everyone has at least one standout performance. There’s a surprising and welcome variety in the production design as well. While some of the plays are quite minimally presented ("Free Range" basically just has an elevated chair), it always fits the story being told. There’s also a rather neat effect at the beginning of "Inheritance" where the curtain opens and the room seems to double in size (the play before it, "Etymology," is performed in front of the curtain). "Oscar Clyde Denman" boasts the most impressive design, depicting a rather convincing girl’s bedroom. The bookshelves in particular show an admirable attention to detail. As far as singling out specific plays for praise, I would have to give special mention to "Free Range" (discussed above) and the tender, thoughtful, and affecting "Thanksgiving in July." Molly Carden and Jenn Harris have a chemistry that is really beautiful to watch. There is tension between them at times, but you always feel the love and intimacy under the surface. It’s a long piece, light on plot, but I grew to love these characters throughout, such that I was genuinely moved when the play reached its conclusion. On the whole, Pressing Matters is an interesting evening of theatre, with six stories that are each uniquely compelling. Pressing Matters is by Jennifer Jasper. Directed by Adrienne Campbell-Holt. Scenic Design is by Parris Bradley. Costume Design is by Adrienne Perry. Lighting Design is by Grant Yeager. Sound Design is by Amy Altadonna. Production Stage Manager is Seth Kieser. The cast is Ito Aghayere, Molly Carden, Saum Eskandani, Jenn Harris, and Genesis Oliver.